Today at high noon [R436R, Sugarloaf], Maine’s tallest winter resort and the largest ski area in the East, kicked off its 61st season. The resort opened with a total of three trails covering 1,750 vertical feet, serviced by the SuperQuad chairlift. Skiing and riding is available on Pinch, Upper Tote Road and Lower Tote Road, and is recommended for advanced skiers and riders only. Lift tickets are currently just $29 for all ages. Despite above-normal daytime temperatures over the past week, Sugarloaf was able to run as many as 110 snowguns during overnight hours and make enough snow to cover nearly three miles of terrain on the Tote Road trail. 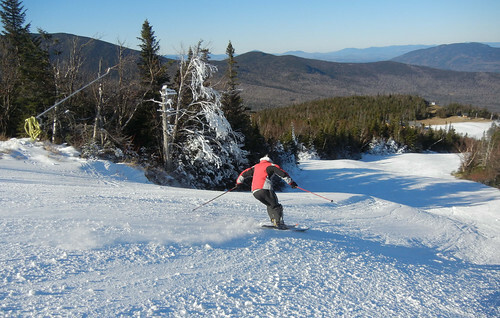 Sugarloaf is the fifth resort in the Northeast to open for the 2011/2012 season. Sugarloaf is now open and more snow is headed their way. Photo Courtesy of Sugarloaf. During the summer Sugarloaf invested roughly $4.3 million toward resort upgrades, including a brand new quad chairlift and over 100 acres of new terrain in the Brackett Basin area. The new Skyline Quad is expected to open in early December. More snow is in the forecast for tomorrow, so get to Sugarloaf for the early goods. For information on snowmaking visit sugarloaf.com.